Development of a sprawling telescope array has made South Africa a world leader in radio astronomy and produced a pipeline of specialized engineers. When the SKA was still just rough plans on paper, South Africans recognized the vital importance of engineering schools to its success. Ten young South African university students were sent to radio telescope observatories around the world to gain experience. “We were not anywhere near in position to build a telescope that was world-class,” recalls project manager Willem Esterhuyse. Since then, the South African SKA organization has funded relevant research by more than 700 students, 42 percent of them engineers, and six SKA research chairs lead centers of excellence at the nation’s universities. “In a decade we have gone from a very minor player in radio astronomy engineering to being one of the dominant players in the field,” says Justin Jonas, associate director for science and engineering at the SKA South Africa and also a professor of physics and electronics at Rhodes University. One of the research chairs, Oleg Smirnov, marvels at the “new-frontier feel” in South Africa created by the SKA. A Russian expert in imaging algorithms for radio astronomy, Smirnov was lured from Europe to Rhodes University to help found its Radio Astronomy Techniques and Technologies group. The three-year-old group has already attracted students and post-docs from four continents. “People feel they are doing something new, something important,” he says. Engineering academics are inspired by the SKA’s constant drive to push beyond existing frontiers of technology. “In general, the SKA needs components that do not exist yet for every component in the whole system,” says Petrie Meyer, who specializes in radar antennas, amplifiers, and filters at Stellenbosch. For example, his colleague Gideon Wiid has just installed an antenna on site for detecting interfering signals that could corrupt the telescope data. Wiid and his students assembled the serrated antenna by hand after 70 iterations, 650 gigabytes of test data, and a year of effort, because the SKA needs a receiver that can detect interference over a wider spectrum than any commercially available antenna could handle. The SKA-funded lecturer believes that his Protea design, named after the local flower, has the widest impedance bandwidth of any single-element, omnidirectional antenna ever made. Still, he is pushing his students to improve on it. One of his post-docs, Joely Andriambeloson from Madagascar, uses the novel technique of printing plastic antennas — later coated with conductive paint — on a 3-D printer. The mono-cone and bi-cone shapes have the potential for very wide bandwidth at a reasonable price. “The spectrum specification from SKA was ‘DC to daylight,’ whatever is possible,” says Wiid. Many other students and academics are also kept busy by the effort to detect, identify, and counteract radio frequency interference (RFI). The telescopes are built to pick up incredibly weak signals that have traveled more than 13 billion years. Electromagnetic signals closer to home — whether from satellites or a farmer’s electric fence — could not only spoil the images of the outer universe, they might destroy sensitive electronics. For this reason, the site has extremely strict rules banning the open-air use of mobile phones, laptops, and even gasoline-powered vehicles. (Sparkplugs are a problem.) The computers to assemble the data from the dishes are being housed in a heavily shielded building sunk into the earth and hidden behind a hill from the field of telescope dishes. “RFI is the biggest risk,” says Davidson, “and it’s a good topic for a university to address because it’s always going to be a concern. You’re never going to say: ‘this is solved.’” At the University of Cape Town’s (UCT) Department of Electrical and Computer Engineering, master’s-degree students are working to establish the fingerprints of the many sources of RFI. “How do you tell if a signal is coming from the fridge next door, not from a galaxy far, far away?” asks UCT lecturer Amit Mishra. So Daniel Czech is developing algorithms that categorize the incoming RFI while James Gowans devises the hardware to pinpoint the location of offending RFI. Sometimes, being there is essential. Ph.D. student Hardie Pienaar spends many hours staring at a computer in Stellenbosch to develop his mathematical model for how RFI moves in the three-dimensional space above the array of dishes. But to test how that model performs in the real world, he has to travel 10 hours to the site along with the quadcopter he has modified to measure RFI. The drone has 3-D-printed legs with embedded antennas and copper shielding to contain its own interference. Pienaar gained valuable empirical data as the device flew in a programmed cylindrical flight pattern 100 meters into the sky above the building where telescope data are processed — at least until battery failure sent it crashing to the ground. The South African-funded MeerKAT is just the beginning, however, a chance for the country to prove to the other 10 nations in the SKA that it has the engineering expertise to be more than just a passive host-site partner. The international SKA organization — based in Britain — will spend more than $700 million on SKA Phase I, building another 133 dishes in the Karoo by 2023 and incorporating MeerKAT’s array The more ambitious Phase II will begin construction in 2023 and is meant to stretch as far as Botswana, Namibia, Zambia, Mozambique, Ghana, Kenya, Madagascar, and Mauritius. In preparation, South African universities are already training engineers from all but one of those countries on SKA scholarships. At that point, the collective area of dishes and antennas will add up to more than a million square meters, hence the name Square Kilometer Array. Jonas hopes that the massive effort will pay off by answering fundamental questions: “How did stars and galaxies form? Does the theory of gravity and relativity hold up? Was Einstein right?” Testing for the gravitational waves posited by Einstein requires ultra-precise timing of pulsar signals arriving at each dish, so they are synchronized with an accuracy of better than 10 nanoseconds over 10 years. “We can do experiments so exquisite you need a celestial lab with pulsars and black holes,” marvels Jonas. The involvement of engineering schools around the globe is increasing as Phase I construction nears. In Canada, one of the SKA partner countries, the Schulich School of Engineering at the University of Calgary is taking the lead in engineering research for the radio telescope. Australia has a special role as host of a separate Phase I array consisting of more than 100,000 small receivers that will look as if farmers have planted vast fields of TV aerials in the western Outback. Engineers at the University of Western Australia and Curtin University in Perth are conducting research to support that array. The United States is not an SKA participant, but American astronomers are starting to take advantage of South Africa’s growing expertise in radio telescope engineering. On a site very near the heart of the SKA, work has begun on an entirely different radio telescope, a collaboration largely funded by the National Science Foundation and driven by astrophysicists at Berkeley, UCLA, MIT, the University of Washington, the University of Pennsylvania, and Arizona State. The Hydrogen Epoch of Reionization Array (HERA) will ultimately be a 13-acre flat hexagon of dishes. David DeBoer, an electronics engineer and astronomer at UC Berkeley who travels regularly to South Africa for work on HERA, says that while the quiet, well-serviced site was one reason to choose the location, the supply of South African engineering skills was another. 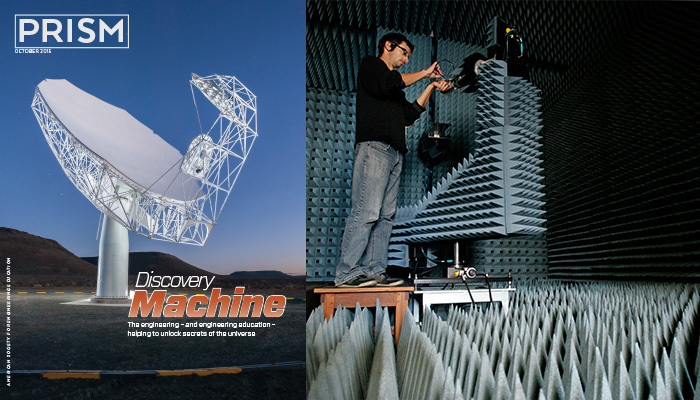 “It’s been an American project,” says DeBoer of HERA, “but increasingly the intellectual content is South African.” In Stellenbosch, for example, master’s student Mariet Venter spends her days optimizing designs for the antenna feed for the low-frequency radio observatory, which will examine the “cosmic dawn” when stars began to shine. Research is only one of the roles the universities play in support of the observatories. “They’re creating a pipeline of skilled people who understand what we do,” says Francois Kapp, who hires electronic engineers for SKA South Africa. “It’s a huge success story.” For example, Simon Winberg, a UCT professor of electrical and electronic engineering, teaches students in his Digital Systems course by asking them to extract the signal from simulated radar data. In turn, SKA’s high profile in South Africa stimulates interest in the field, driving growing numbers of students to apply to the department, he says. But Winberg notes that as graduate students come to appreciate the complexity of SKA research, many seek easier topics. Four SKA-funded research projects in his department went begging this year. That’s not all bad for an organization more interested in quality than quantity, according to Kapp. “We’re trying to tease out the interest of the really strong students,” he says. To accelerate the local supply of big-data expertise, three South African universities last month formed the Inter-University Institute for Data Intensive Astronomy. UCT Professor Russ Taylor, the founding director of the institute, says that it will pool talent across departments as well as universities. “It’s not just an astronomy problem; it’s a problem of computer science, computer engineering, mathematics, and statistics,” he explains. The institute plans to fund and train at least a hundred data scientists, from undergraduate to post-grad. MeerKAT will use a custom-built computer correlator to amalgamate signals from its 64 antennas. The core of MeerKAT computing is the ROACH board, originally developed for radio astronomy at Berkeley and “perfected by the SKA and Stellenbosch University” according to Davidson. Berkeley’s DeBoer says that the latest generations of ROACH boards from South Africa are used in observatories around the world. Even NASA uses South African technology. “South Africa is now one of the world leaders in radio astronomy,” says DeBoer. UCT post-doc Lerato Mohapi is using the RHINO board — a ROACH board descendent designed at UCT—to develop a computer language from scratch to allow easy algorithm upgrades to the electronics on the dishes. Mohapi, from Lesotho, sees spin-off benefits from astronomy’s demands. “SKA will be the foundation of Africa as a center for high-performance computing,” he predicts. The effectiveness of the computers will depend in large part on those like Smirnov who are writing the algorithms to process the data. At the offices of SKA South Africa, overlooking Cape Town’s Table Mountain, the bearded Russian points to one speck among thousands on a computer screen showing a radio telescope’s view of the heavens. “Can you see this thing on the side of that blob?” he asks. “Is it a jet from an active radio galaxy or an artifact of imaging?” Corruption can come from RFI, the antenna itself, or the ionosphere. “The challenge is how to eliminate all of this crap,” says Smirnov. It’s a challenge he is facing squarely. Earlier this year, his algorithm achieved a record dynamic range of 5 million to 1 between the strongest radio signal from space and the background noise and artifacts. It’s not just computing that will keep engineering departments busy for decades to come. Phase II is scheduled to be completed in 2030. And while the lifespan of the dishes in the array is at least 50 years, the electronics might be upgraded every decade. “I believe MeerKAT will be driving activities at universities for a very long time,” says Esterhuyse. In fact, a freshman engineering student in 2015 could retire as a professor in 2062 without running out of problems to solve for the radio telescope. So the SKA sponsors engineering academics to look far into the future. In a clean-room laboratory at the University of Pretoria, Tinus Stander carefully adjusts the electrodes on a wafer probe station to test a semiconductor chip just back from the foundry. Stander and his graduate students are designing an integrated circuit that puts three separate devices currently found on MeerKAT dishes — the amplifier, filter, and digitizer — onto a single chip. This radical idea could have dramatic advantages in speed, performance, and cost.